Ever had a movie where you could hear only the sound but there were no video? Or only video and no sound? That's almost certainly a codec missing! CodecInstaller is here to help you understand which codec you need and to let you install it in minutes. 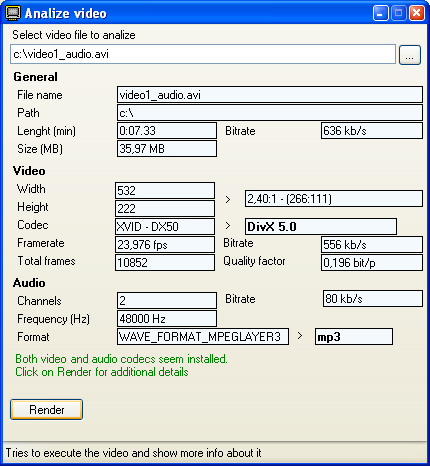 CodecInstaller is a Windows program that detects the Audio and Video codecs installed on your system, analyzes files to understand which codecs they require and suggests you to install them. Check out the features tour for usage examples and screenshots of the program.